SKLEER All in One Skin Corrective has a unique patent pending gel formulation that carries the natural herbal ingredients deep into the skin to assist with restoration and healing. SKLEER’s proprietary gel formula allows for invisible application which remains in the skin for a prolonged period of time, locking in the active ingredients to work synergistically and refresh the skin. Unlike other topical ointments and creams that are sticky and uncomfortable on the skin, after applying SKLEER All in One Skin Corrective you will notice within about 30 seconds the gel essentially disappears, leaving an invisible protective layer on the skin. SKLEER’s miracle gel, draws its natural herbal ingredients into the lower layers of the skin which are the actively dividing layers of the skin. This provides a wonderfully moisturising environment, while the skin naturally replenishes itself. The upper dead surface layers of the skin (epidermis) are the protective layers of the skin, which act as a barrier to moisture escaping. In dry climates or in individuals with dry skin, this epidermal layer is often unable to cope and too much moisture is lost from the skin. Excessive showering, bathing or cleaning may worsen this by exfoliating away the epidermal layer due to the harsh effects of soap. SKLEER supplements the skin’s epidermis, by providing an extra invisible layer that locks in SKLEER’s natural herbal ingredients and the skin’s natural moisture and sheen. Unlike other topical ointments and creams, which are sticky and uncomfortable and stay on top of the skin, after applying SKLEER gel to the skin, you will notice within about 30 seconds the gel essentially disappears. 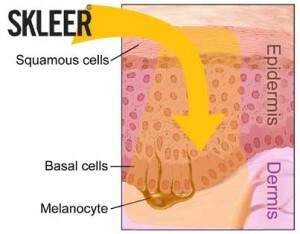 What the unique and proprietary formulation of the SKLEER gel does, is it draws the SKLEER’s natural ingredients, into the lower layers of the skin, which are the actively dividing layers of the skin, and locks them in providing for a great environment for your skin cells which is deeply refreshing and moisturising. This allows for skin appearance to improve. The combination of essential oils in SKLEER: Eucalyptus, Tea Tree, Caraway, Cinnamon and Cardamom work synergistically and help to make your skin feel fresher, tighter, cleaner, more radiant and clear. Because SKLEER is developed by an international consortium, we can source the highest quality natural ingredients from the best locations worldwide. Where you source natural ingredients from can make all the difference. Unlike other products, that claim to have similar effects to SKLEER, SKLEER All in One Skin Corrective contains no added Acids or Alkalis (See Natural Ingredients). These tend to dry out the skin over time, and in the long term are damaging to the skin. Many of those products also have what is known as a “rebound phenomenon”, where the skin temporarily looks and feels better, but then in very short time, the skin actually feels worse, forcing the customer to want to re-apply the product, and be locked into a recurring situation. SKLEER has no such effect. SKLEER All in One Skin Corrective contains no Parabens. SKLEER also contains no cortisol or corticosteroid type components, which after long term use cause thinning and attenuation of the skin. SKLEER has no Benzoyl Peroxide. 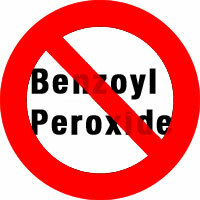 The most common treatment for acne is Benzoyl Peroxide. This is found in the many over-the-counter treatments that are heavily advertised. Benzoyl peroxide creates free radicals in your skin, which can lead to premature aging and diminish your skin’s ability to heal. It’s a vicious cycle… it damages your skin leaving you looking overly sunburnt, but you remain that way longer because your skin can’t heal itself normally. 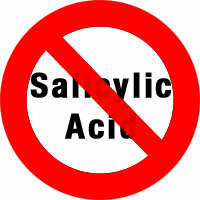 SKLEER has no Salicylic Acid. Salicylic Acid is another common ingredient found in many different face washes and scrubs. The side effects are irritation and burning in the skin. If you are using a Salicylic Acid product combined with a Benzoyl Peroxide product — which many do — the irritation takes even longer to heal.